It's officially December and we're anxiously awaiting the now-belated arrival of our daughter! In my head, she was always a November baby, so this is certainly a nice lesson in patience. Since I have plenty of time on my hands while I wait for my body and baby to do their thing, I put together this children's book wish list for the upcoming holiday season. Our children's literature collection is fairly extensive (I'm a collector! ), but I realized recently that I own almost zero holiday-related books. One of my favorite memories from childhood is curling up near the fireplace with my parents and sister to read Christmas stories. The books on this list include some childhood favorites as a well as a few I've discovered as an adult in my time teaching preschoolers. With a baby on the way, I figure this is the perfect year to start building the collection for all of the Christmases to come. Please don't hesitate to share your own favorites below: I'd love to hear. Normally, I'd indicate why I included a title, but I think part of the beauty of children's literature is discovering that magic for yourself. These are all books I whole-heartedly endorse and plan to add to my daughter's shelves over the years. Happy reading! *Books with an asterisk are not specifically about Christmas, but still favorable for welcoming the winter holiday season. Also, the Gruffalo by Julia Donaldson, as well as The Gruffalo's Child and Room on a broom. Also both made into an animation movie, broadcast on BBC every year around Christmas day! 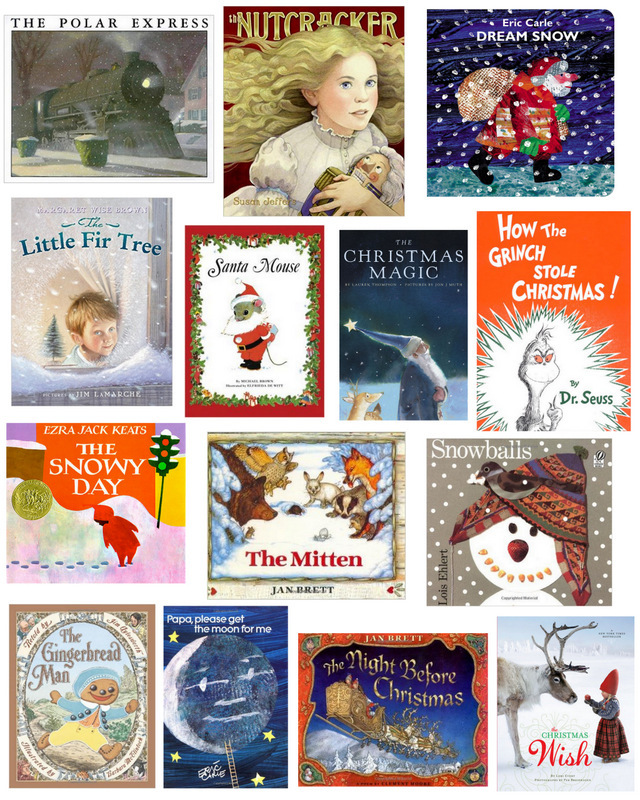 These are not really Christmas books, but still very holiday-ish to me! Lots of luck to you, I check in every once in a while to see how you're doing. All the best for you, the baby and your hubby! In most cases, It's safe to specify so why That i enclosed a good brand, however , It is my opinion an area of the wonder for baby's booklets is certainly identifying the fact that powerful for your self. Most are most of training books That i whole-heatedly endorse together with method to include on my best son's display unit gradually. Completely happy browsing!